The Ashland Municipal Court is located at the Civic Center at 1175 East Main St.
Due to recent staffing transitions, Ashland Municipal Court will be closing early on Thursdays (at noon) until further notice. Please note, the Ashland Police Department is unable to assist with court matters. Thursdays 8:00 a.m. to noon. Judge Turner holds Court every Tuesday starting 9:00 a.m. Juvenile cases are heard at 8:30 a.m. in the Judge's office. The Court has jurisdiction over three types of cases, all of which must take place within the Ashland City limits: traffic violations, violations of the Ashland Municipal Code and most misdemeanors. Minor traffic violations are handled at the front counter by the Court staff. The clerks are authorized to offer the same options as the Judge would assess in Court. 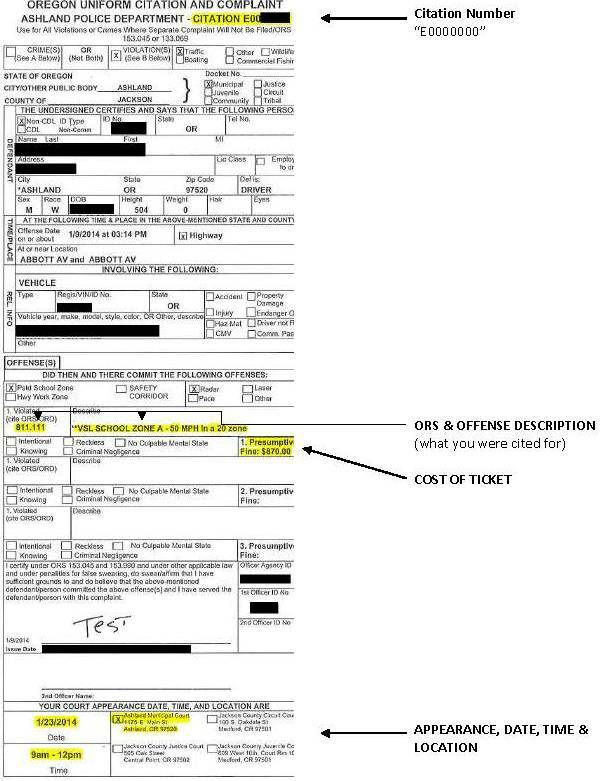 Any option given at the counter on minor traffic violations are the same the Judge would assess in Court. Any questions regarding the Ashland Municipal Court may be addressed by letter, email or phone during normal business hours. 1. How do I read my ticket? 2. Where do I find my citation number? Or at the end of your citation. Your citation number generally begins with the letter E, unless it is a hand written complaint. If it is hand written, contact the Court for your citation number. 3. Do I have to appear? Appearance is not mandatory. You may call, submit a written plea, appear at the counter during office hours on or before your scheduled appearance date. The Judge requests your presence on all Municipal Code Violations. If you are unable to appear , you must contact to the court prior to your scheduled date and time, to arrange a new appearance date. Your appearance is required. Failure to appear will result in a warrant for your arrest. If you are unable to appear, you must submit a written continuation request to the Judge, prior to your scheduled appearance date. Your request for continuance must be approved by the Judge. *Please allow at least one week for your case to be filed with the court. 4. What happens if missed my payment? First, contact the Court to check the status of your case. Any clerk will be able to assist you. Court action against your driving privileges in the State of Oregon. With late/missed payment, your case may have been turned over to Southern Oregon Credit Services for Collections. An Order for Show Cause may be sent you at your last known address ordering you to appear in court on a specific date/time to explain to the Judge why you are not in compliance with your probation or DSA. A warrant for your arrest due to non-compliance. 5. How do I request a trial? To request a trial, you must submit a written plea of "not guilty" on or before your scheduled appearance date. You can do this by mail or by appearing at the Court counter during office hours. Once the Court receives your plea, you will be given a trial notice with your trial date. You must sign and return this form to the Court a week prior to your trial unless otherwise instructed by a clerk. Trials are generally held on the 2nd & 4th Tuesday of each month at 1:30pm. Some blackout dates may apply. If you cannot appear in person, the Court offers a Trial by Affidavit. Contact the Court for more information. The Court does not appoint representation on traffic and code violation cases. If you wish to retain your own attorney, you must file a notice of representation 10 days prior to your trial. 6. Where do I find Ashland Municipal Code? The Ashland Municipal Code is located online on the City's home page www.ashland.or.us or by clicking here. 7. I have received a notice for Jury Duty, what do I do next? Complete the questionnaire and return it to the court ASAP. Please visit our Jury Duty section on the website for more information. 8. What do I do if I am late on a payment? If you are late on a payment for a traffic violation, you are to pay your balance in full to the court. If your driving privileges have been suspended, you must contact the Oregon DMV to pay reinstatement fees. Once your account has been turned over to the collection agency, you are to pay Southern Oregon Credit Services Inc. directly. Once you have paid your balance in full, the court will be notified and your case will be closed. 9. Where do I handle parking tickets? Do not go to the Municipal Court in person. The clerks are unable to assist with parking tickets. Call (541) 552-1422 Monday-Friday 8:30 am-5:00 pm to pay your parking ticket by phone. Parking enforcement is handled by Diamond Parking, a private company contracted by the City of Ashland to enforce parking laws. If you received a parking ticket, your options are listed below. Pay the ticket within 10 calendar days of the date the violation is issued. Police Department (drop box is located near the parking lot, or you can give the envelope to one of the clerks, cash accepted at this location. City Hall (the box is located on a pole outside the Plaza side of City Hall) 20 E. Main. Write a letter, within 10 calendar days, explaining why you are appealing the ticket. Include your name, address and phone number along with the payment for the ticket. The Ashland Municipal Judge will review the letter. If the charge is dismissed, the check is returned to the sender. The appeal process usually takes two weeks. 10. What do I do if I have a warrant? All Ashland Municipal Court warrants are serviceable in Jackson County only. Turn yourself in to any local law enforcement agency in Jackson County, Oregon. Appear at the Ashland Municipal Court during office hours. An officer will be called to serve the warrant. Appear any Tuesday morning at 9am for arraignments (excluding holidays.) You will be placed in the Bailiff�s custody until you appear before the Judge. Once a warrant has been issued, you are subject to arrest at any time. 11. Where do I find Oregon Traffic Code? If you were cited for a traffic violation and you would like more information, please visit the State of Oregon website: www.oregon.gov or click here.